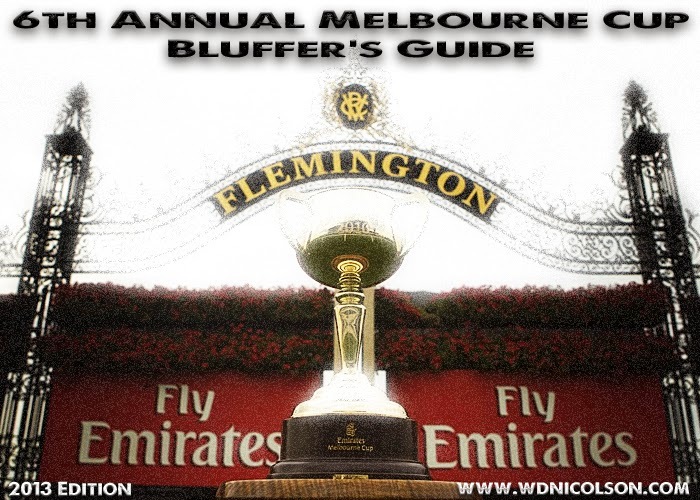 Welcome to the 6th Annual 'Bluffer's Guide to the Melbourne Cup'. It is firmly entrenched as the go-to piece here on www.wdnicolson.com every November, as we take a less than inspired look at the huge field for the 3,200m race at Flemington and judge the horses in the race based purely on the quality of their name. And last year, in 2012 - Mount Athos was picked to win and came in 5th, Glencadam Gold was tipped as a roughie and came in 6th, while the rest of my selections stunk deluxe... And of course, Green Moon continued to get the 'Pride of Endor' wordplay treatment but no love from my selections... and then won the thing. So while the notes about the horses are what drives this piece, our track record picking runners to feature at the pointy end of the field isn't bad at all (well apart from last year's debacle). But you aren't here for any punting tips, you're here to see if for the 6th straight year I can come up with some moderately interesting lines pertaining to the competing horses in the 2013 Melbourne Cup field right? As we stress here on www.wdnicolson.com every year, think long and hard about what you could spend (or save) the excessive money you punt with on Melbourne Cup day... in short, don't be an idiot. Anyhoo, to the Bluffer's Guide for another year and each horse has its current Sportingbet prices (as of 4/11/13) listed next to the horse's name and then you can read the 'Scouting Report'. $41 bucks to win? Aragorn will not be pleased. Won it last year and is The Pride of Endor. No word if Wicket is on board this time out. 60% of the time, it wins... everytime. Current favourite... but last year's bio is worth repeating. If it wins - smart money is on a newspaper headline as follows: Fine and Dandino! I think it won something of note recently so that's a good sign... and brother James hit a quick fire 100 in a recent ODI - so signs a-go-go for this horse! 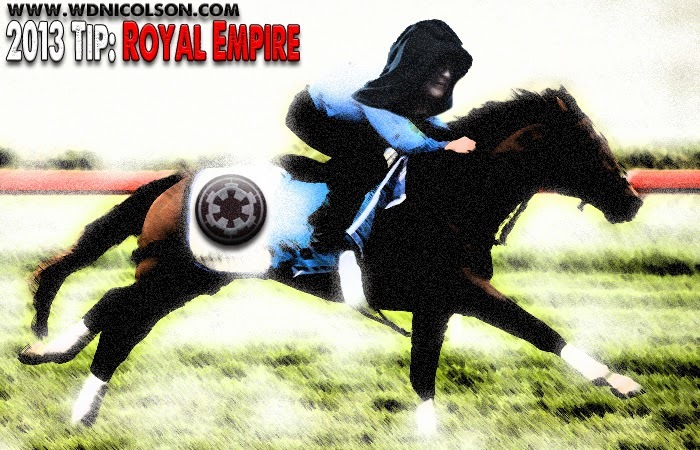 Why hasn't there ever been a 'Horseman' superhero? We picked it last year on name alone... punters still like its chances. So it might just be ready to... explode? With all due respect it's no Galactic Empire... unless the Emperor himself is taking the reigns... but nice to have two Star Wars references on offer this year kids. I don't want to know what this means in French... it's cooler sounding without that knowledge. For all we know it could be 'Runs from Toilet'. Does nothing for me name wise... so can't win. Argentinian midfielder of some note in the 1990s right? Stumped me... even a walk out on to the balcony and back gave me no inspiration. Yet this horse is $14 to win the Cup so it has something going for it surely? Ashton Kutcher doesn't want to see any more of this horse... get it? The horse is pretty blue right? Last horse and it's giving me nothing... where is Waikikamukau when you need it in the field to keep things interesting? Ok that's the name game taken care of... now to the actual predictions. Roughies - Super Cool at $51 and Dunaden at $41. Let's be honest - we've got no idea about any real chances here but hopefully this wasn't the worse read you've had in early November. So after that mishmash of referential wit, ask yourself why aren't your Melbourne Cup selections based on name alone?